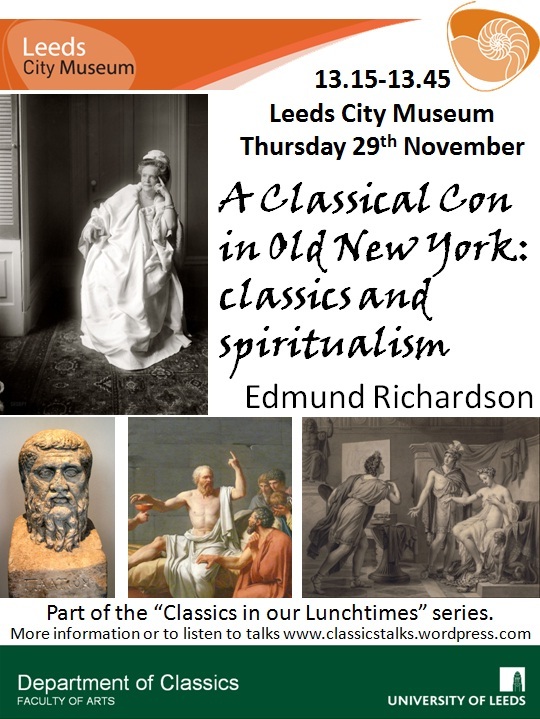 Edmund Richardson, speaks about “A Classical Con in Old New York: classics and spiritualism”. In April 1888, ‘the noted and notorious Ann O’Delia Diss Debar, of many aliases, a number of husbands, and several prison terms’ went to court in New York. She had swindled Luther Marsh, one of the city’s most distinguished lawyers, out of his mansion on Madison Avenue – and she had done it through the ancient world. Diss Debar approached Marsh, claiming to be able to communicate with the dead. Messages from his dead wife gradually gave way to portraits painted instantaneously by the ‘spirit’ of Apelles, letters from Plato, advice from Socrates, and promises of Marsh’s own immortality. At length, the police paid a call on her – and her court-case became the sensation of the day. In 1888, New York was transforming itself at a bewildering pace – old landscapes giving place to new, almost overnight. Yet longing for the ancient world could be glimpsed around every corner. Diss Debar’s trial bottles the urgency and passion of contemporary remembrance – how the ancient world was fought over by criminals and policemen, journalists and dupes. It captures a moment when America wondered if it would be possible to put an end to oblivion, once and for all. For a list of the “Classics in our Lunchtimes” talks, held on the last Thursday of the month, from October to February in Leeds City Museum, see this post.